There may be circumstances in which you are going to require a prepayment (i.e. deposit) from your customer. There are a variety of reasons for this practice (new Clients, custom work, a Client with a bad track record in paying on time, etc.) If you need to account for a Customer Deposit here's how. In this context, we are applying a general deposit on account to be applied against some future invoice. This deposit is not tied to any specific invoice yet. If you want to Invoice a customer now and collect a pre-payment before shipping, you may want to look at the Deferred Revenue feature. If you have already entered a Customer Deposit and you need to know how to apply the Deposit to an Order then check out this article on How to Apply a Customer Deposit. 1. Open the Receipt window. 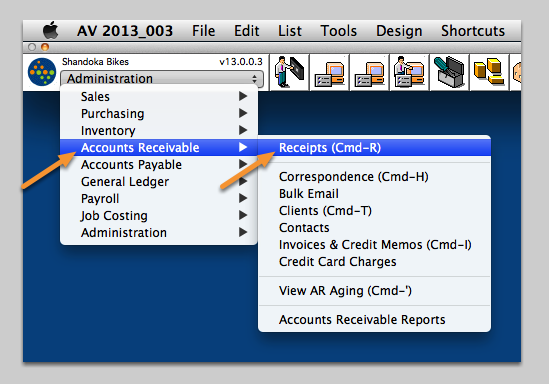 Navigate to Accounts Receivable ➤ Receipts. 2. 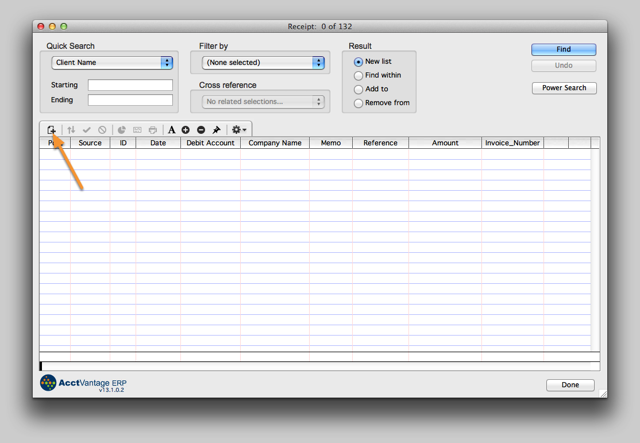 Create a new Receipt. 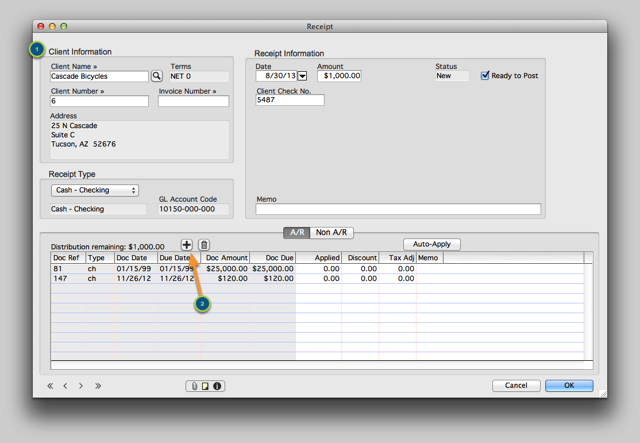 Click the Create New Record icon or use the keyboard shortcut Command + N.
Zoom: Create a new Receipt. 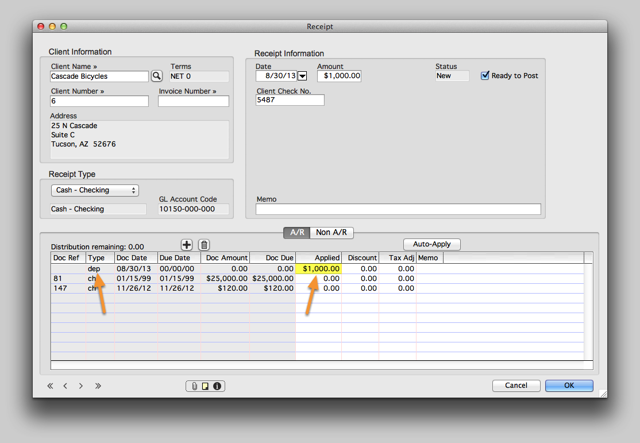 Fill out the Client Information and Receipt Information just as you would when creating a normal Receipt. Click the plus (+) symbol to proceed with entering the Client Deposit. You will be prompted to either enter Invoice Number (i.e. 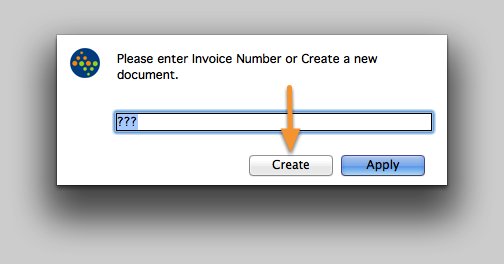 Apply) or Create a new document. Click the Create button. 3.2. 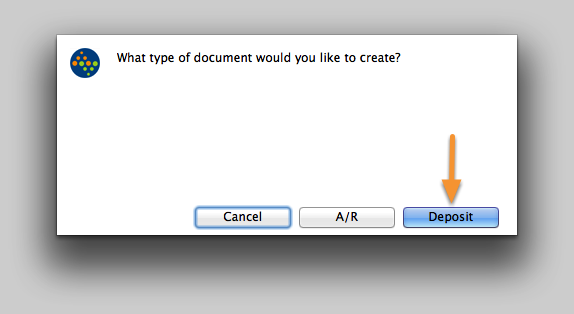 What type of document would you like to create? What you choose here depends on which GL account you want to post the pre-payment to. A/R: Posts a credit to the Client's Accounts Receivable sub-account. Whichever you choose, a credit will be entered onto the Client's account and can be applied to future invoices. The decision to use the Deposits Liability or Accounts Receivable account is up to you (and your accountant). 4. Enter the Amount of the deposit. If you selected Deposit in the previous step then you will see a new line that has the Type = dep. Enter the amount of the Receipt in the Applied column. When the Distribution remaining = $0, click OK to save and don't forget to post! Zoom: Enter the Amount of the deposit.